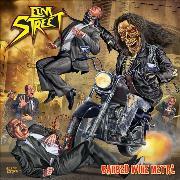 Australia´s ELM STREET debuts with an album that will be recognized by al fans of classic metal. Eight years after their conception ELM STREET takes their IRON MAIDEN, JUDAS PRIEST, MEGADETH and GRIM REAPER influenced metal to the retailer´s. Live they have played with Australia´s finest e.g. BLACK MAJESTY and THE ANGELS. Amusingly enough this youngish quartet has enlisted the aid of legendary thrash cover maestro Ed Repka. But what do they sound like, and are they as splendid as the info sheet says?